The average cost of assisted living in Ellensburg is $3,165 per month. This is lower than the national median of $3,346. To help you with your search, browse the 13 reviews below for assisted living facilities in Ellensburg. On average, consumers rate assisted living in Ellensburg 4.5 out of 5 stars. Better rated regions include Wenatchee with an average rating of 4.7 out of 5 stars. Caring.com has helped thousands of families find high-quality senior care. To speak with one of our Family Advisors about assisted living options and costs in Ellensburg, call (855) 863-8283. Ellensburg is the most centrally located city in Washington and has a population of about 20,000. It’s east of the Cascade Mountains and 36 miles from Yakima and 110 miles from Seattle. As the home of Central Washington University, Ellensburg is a mix of farming community and college town. More than 10 percent of its population is 65 and older. Seniors in the city who are exploring assisted living have four facilities to choose from. They’re licensed by the Washington State Department of Social and Health Services, Aging and Long-Term Support Administration. These facilities house at least seven residents and help with activities of daily living. The cost of living is higher than the national average but below the Washington average. A score of 100 represents the national figure, and Washington scores 121. Ellensburg gets 110. Seniors may have to pay more for assisted living in Ellensburg than in other states, but it is cheaper than some other areas of Washington. Seniors who dislike rain are in luck. Ellensburg receives a mere 9 inches a year, but it does get an average of 22 inches of snow. The low in January is 23 degrees Fahrenheit, and the high in July is 84 degrees Fahrenheit, making for a relatively comfortable living climate. Ellensburg presents mixed numbers for crime rates. On a scale of 1 to 100, with 100 representing the highest crime rates, Ellensburg scores 56.9 for property crime and 10.3 for violent crime. Since property crimes include motor vehicle theft and burglary, they may be less relevant to seniors than violent crimes, which include robbery and murder. The air quality in Ellensburg can be unhealthy during parts of the summer due to forest fires. Wood stoves in the winter can also affect the city’s air quality. Seniors should heed any alerts and take precautions to stay safe. Central Transit provides public transportation, and it’s free — for everyone. Buses run seven days a week, giving seniors the flexibility to venture out any day of the week. Ellensburg has diverse arts and culture opportunities through Central Washington University. Elsewhere in the city, seniors can also enjoy the Clymer Museum & Gallery and annual events such as the rodeo and Jazz in the Valley. Assisted Living costs in Ellensburg start around $3,165 per month on average, while the nationwide average cost of assisted living is $4,000 per month, according to the latest figures from Genworth’s Cost of Care Survey. It’s important to note that assisted living rates in Ellensburg and the surrounding suburbs can vary widely based on factors such as location, the level of care needed, apartment size and the types of amenities offered at each community. 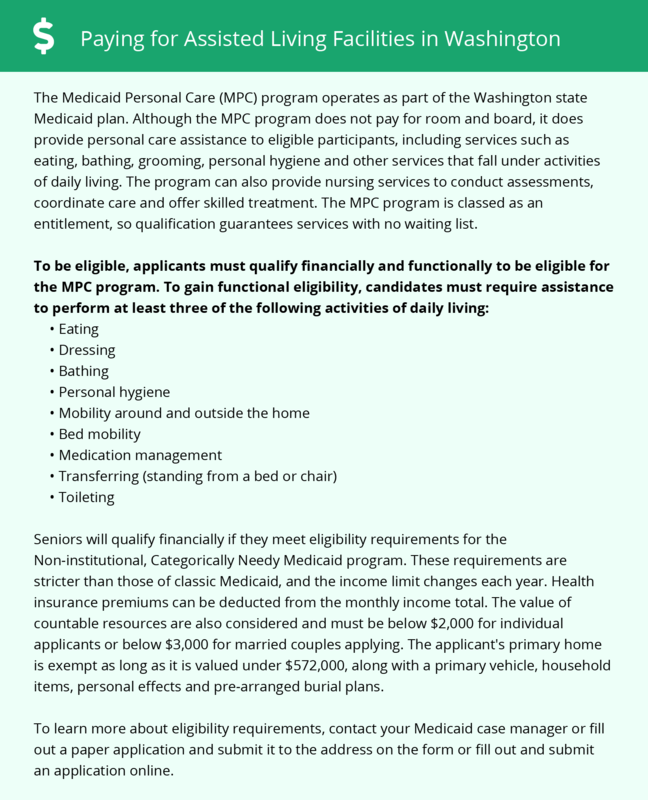 Two Washington programs, Medicaid Personal Care and COPES, may help qualifying Ellensburg residents with assisted living costs. Washington also has two other programs, New Freedom and Community First Choice, that have assisted living options. Learn more about these programs, plus who’s eligible, on our Assisted Living in Washington page. For more information about different ways to finance assisted living, visit our Assisted Living in Washington page. Ellensburg and the surrounding area are home to numerous government agencies and non-profit organizations offering help for seniors searching for or currently residing in an assisted living community. These organizations can also provide assistance in a number of other eldercare services such as geriatric care management, elder law advice, estate planning, finding home care and health and wellness programs. To see a list of free assisted living resources in Ellensburg, please visit our Assisted Living in Washington page. Ellensburg-area assisted living communities must adhere to the comprehensive set of state laws and regulations that all assisted living communities in Washington are required to follow. Visit our Assisted Living in Washington page for more information about these laws.